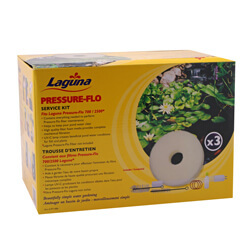 Laguna Pressure-Flo Service Kits contain everything you need to perform maintenance on Laguna Pressure-Flo Pressurized Pond Filters. The super absorbent foams and UV-C lamp are custom designed to fit inside Laguna Pressure-Flo Filters. The service kits are ideal for the spring season.